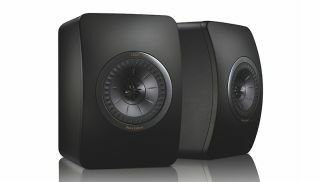 KEF unveils special LS50 Black Edition speakers | What Hi-Fi? KEF's Award-winning LS50s now boast a brand new finish and a sprinkling of special touches. Each pair of speakers also boasts matching black trim rings and comes with its own diamond cut deco plaque and unique laser-etched serial number. Given the internals mirror those of the standard, multi-Award-winning LS50s and pricing has remained the same, we doubt the audio performance will leave you disappointed.